Do you remember what you were like at age 25? It was only four years ago for me, and I already think I was pretty much the worst back then. Seamus Blackley also doesn’t have a stellar opinion of the man he used to be at 25. 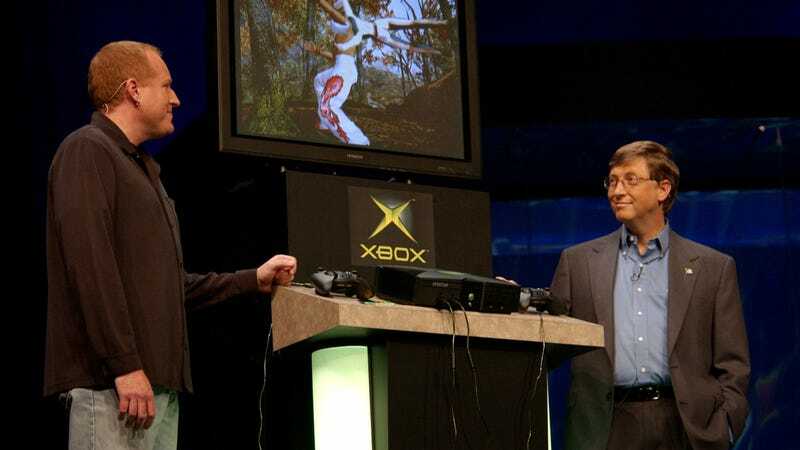 At the time, he was executive producer on the poorly-received Jurassic Park game Trespasser, and also “probably an insufferable jerk.” Blackley also said that the disaster that was Trespasser lead to the creation of the original Xbox. Trespasser was developed by Dreamworks Interactive, released for PC in 1998, and billed as a sequel to the movie The Lost World: Jurassic Park. Hopes were high for this game, as the partnership between Microsoft and Dreamworks was being lauded as a move that would elevate games to the same level as Hollywood. I remember puzzling through a demo of Trespasser as a child, the disc a hand-me-down from my older brother. I wasn’t especially good at video games at the age of eight, but even as a kid I understood that what I was playing was a mess. It had a very realistic physics system, but that also meant that doing something as simple as picking up a box was a chore. As a foray into what would become the genre of open-world games, it offered the promise of endless exploration, but the newness of that idea meant that I had no idea where to go or what to do at any given moment. I never got out of the starting area. In retrospect, Seamus Blackley’s dream that video games would one day let players choose their own adventures in a wide-open world was not wrong. Over email, Blackley told Kotaku that the game was inspired by his own youth playing in the deserts of New Mexico. As a young programmer at the groundbreaking studio Looking Glass Studios—creators of System Shock, Thief, and Ultima Underworld—he saw that rapid advances in tech would soon make this possible. When asked where it all went wrong, Blackley points the finger squarely at his own ego. Blackley had been something of a wunderkind at Looking Glass. He’d written the physics system for System Shock, and then made Flight Unlimited entirely based around that physics system. All those games were critical successes. “I figured that I was capable of pooping rainbows,” he said. He left Looking Glass in 1995 and went over to Dreamworks Interactive, the new studio co-founded by Steven Spielberg and Microsoft. He soon found himself in over his head. “First and foremost, I had no idea how much help and guidance I had been getting at Looking Glass,” he said. “So when I went to run the project, it was a mess. Second, I was writing a completely unprecedented physics system to drive the game, while also being the boss,” he said. “So I was my own worst bottleneck, and a terrible example and metric for the team.” It didn’t help that he was young, working for “big scary movie bosses” on the Spielberg end of things, and hadn’t yet learned how to assert himself to them. Working on Trespasser taught Blackley a lot about himself, and about how to make a game like that work. Trespasser released before it was actually finished. He said that none of the things he imagined for the game were actually impossible to produce, but his own mismanagement lead to the team being forced to ship a broken game. Bugs like this one, while amusing, plagued players. The things that Blackley envisioned for games are commonplace now. This month, Rockstar shipped its own huge, historical open-world game, Red Dead Redemption 2, and Kirk Hamilton’s descriptions of its pleasures reminded me of how Blackley described Trespasser over email. For Blackley, seeing these ideas implemented now is awe-inspiring. If not for Trespasser’s failure, we might not have the Xbox. After the game flopped, Blackley jumped ship to Microsoft. “Bill Gates was an investor in Dreamworks, and I had shown him a tech demo, and he joked with me at the time that I should work at Microsoft,” he said. He took him up on the offer during the fallout from his broken game. He was put in charge of Windows graphics for games. Blackley demonstrating the new XBox in 2001. In 1999, Sony announced the PlayStation 2. “When [Sony] started talking about how they would beat the PC in 3D, I wrote a memo on how in fact, we could beat them, and, with the lessons from Trespasser on tech, teams, and PR, I started down the path of making that a reality,” he said. The philosophy behind the original Xbox pitch—”the openness, the demos, the developer-centric plan, all of that” was directly inspired by Blackley’s experience making Trespasser. Updated: RIAA never really claimed Limewire owed it $72 trillion—that&apos;s "trillion" with a "T"